Archbold quarterback Brandon Taylor carries for positive yards Friday against Delta. The Bluestreaks shut out the Panthers by a 34-0 final. 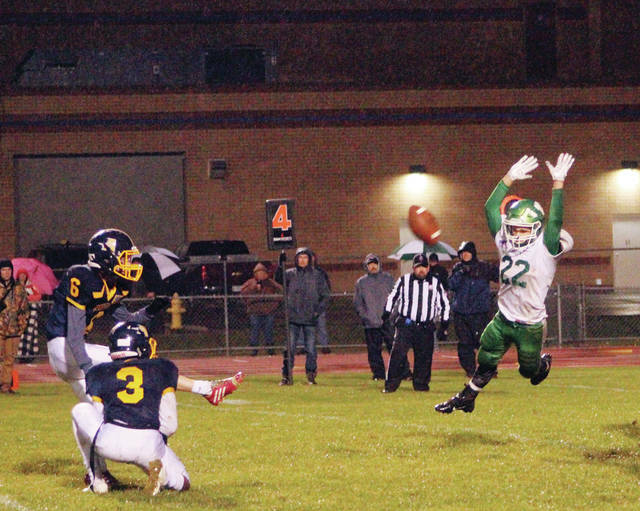 Delta’s Shawn Cook (22) attempts to block a field goal during the second half of Friday’s game. The try was no good. 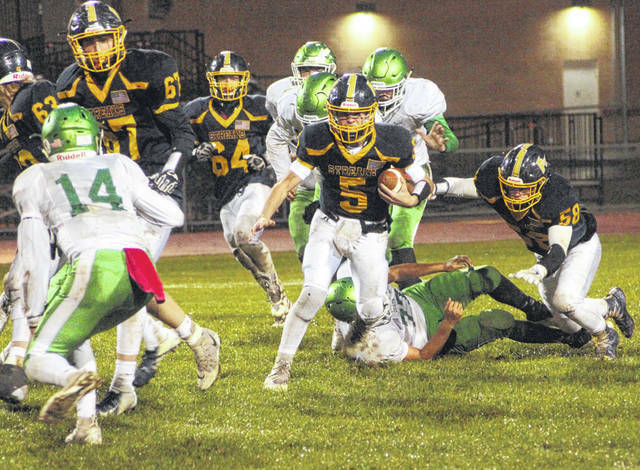 Archbold scored five times in the first half to initiate a running clock for the second half, as the Bluestreaks routed visiting Delta 34-0 Friday in Northwest Ohio Athletic League football. The win snapped a three-game losing streak for Archbold, but it extended a losing streak for the Panthers to five games. The Streaks scored twice in the opening quarter. Zach Rocha ran one in from two yards out and Elijah Zimmerman added the extra point. Then with 2:29 left in the first, quarterback Brandon Taylor hit Antonio Cruz for a 25-yard score to make it 14-0. Just four seconds into the second stanza, Archbold tailback Izrael Reyes ran one in from two yards out, however, the extra point was no good to keep the margin at 20-0. On a later drive, Taylor connected with Isaiah Gomez for a 23-yard score and this time the extra point was made by Devin Witte. The Streaks capped off the game’s scoring with just 36 seconds to go in the first half when Rocha scored on a seven yard run. Delta nearly punched one in at the end of the contest but they were stopped at the goal line. Archbold (5-3, 2-3 NWOAL) is at Evergreen this Friday. Delta (2-6, 0-5) welcomes Swanton.